Thousands of people dismissed from their job after the coup will go back to work, said Temelli. HDP (Peoples’ Democratic Party) co-chair and candidate, Sezai Temelli, visited Istanbul University on Wednesday. “I have been a member of this university for 35 years”, he recalled in his speech in front of the university. “I am proud to be a member of Istanbul University, such an important institution. This is the university that provides the greatest contribution to scientific research in Turkey”. Reminding that he could not enter the university where he worked for 35 years as he is also a dismissed academic, Temelli said: “Today, after 35 years of labor, my friends and I will not be able to enter our faculty, should we want to visit it. We were dismissed with the KHK (statutory decree) . Our labor was ignored. After the 15 July coup, there were those who suffered from the greatest victimization because of the OHAL (State of Emergency). The KHK was introduced in an arbitrary manner”. 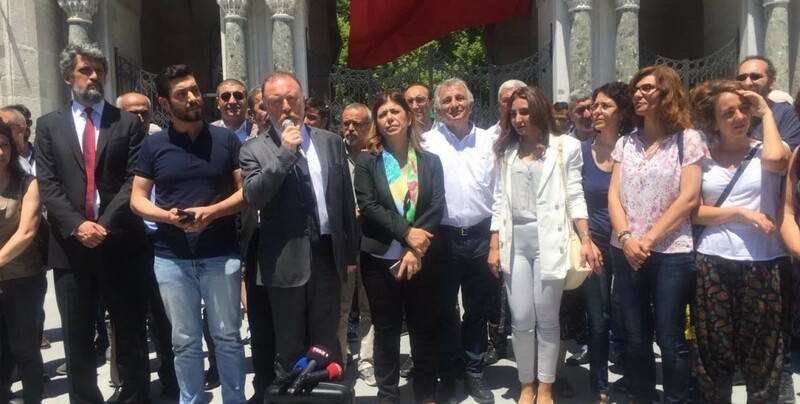 Temelli added: “The most important promise we made as HDP is to lift the OHAL after 24 June, ensuring that all the victims of the KHK will be reinstated and could resume their work”. The HDP co-chair, who urged to work hard to overcome the threshold in the name of democracy, said: “Both in our party and Presidential program we stated that we want to normalise this country. We believe that we can solve all problems together following ordinary process. We can get rid of the OHAL and the mentality behind it. All our friends who have been victims of the OHAL will be able to return to work and give their contribution to the society”. After 24 June, Temelli said, not just people have been dismissed from universities, but also teachers who had been dismissed from many schools, as well as people working in the municipalities and the health services. “Universities are ours. Stepping up the university’s autonomous democratic struggle is to contribute to Turkey's struggle for democracy. We will continue to raise the challenge of protecting universities from the influence of political tutelage”.